Facebook gets a lot of flack for the energy consumption in their data centers, but the social media giant's central Oregon facility could change that. 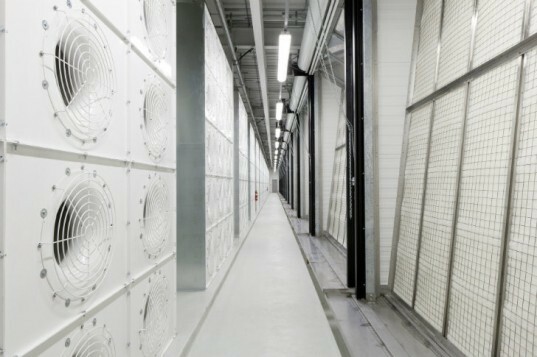 The Prineville Data Center has achieved LEED Gold certification and proudly boasts an innovative mechanical cooling system that uses almost zero energy to lower the temps in the server rooms. Couple that with employee-friendly office spaces, a rooftop solar system and rainwater collection and you have yourself a delightful data center. 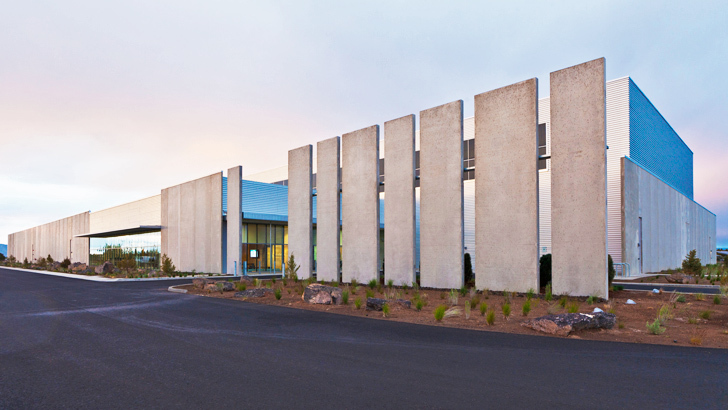 Designed by Chicago-based Sheehan Partners, the Prineville Data Center is a model for digital information storage. The Prineville Data Center enjoys a high desert climate, meaning low humidity and temperatures that get pretty hot in the summer. At first, this wouldn’t seem like a good place for a data center, but actually it is and Sheehan Partners capitalized on the climate in order to make the center more energy efficient. Data storage requires a lot of energy just to run the servers themselves, but the centers also have to work very hard to keep the equipment cool – hot computers don’t run very well. The Prineville center relies on evaporative cooling – pulling in dry air, misting it with water and then as it evaporates the temperature lowers. In fact the system is so efficient, the center consumes almost zero energy to keep the servers cool. Facebook’s Oregon center runs 38% more efficiently than other state-of-the-art data centers, yet it cost 24% less to construct. The EPA requires centers to run at power usage effectiveness ratio (PUE) of 1.5, but the Prineville center runs at 1.07, which is close to the ideal 1.0 where no energy is expended beyond what the computers use. Besides creating an super low energy cooling system, Sheehan Partners also worked hard ensure the center used as little energy as possible elsewhere. They topped the center with a photovoltaic system and harvest rainwater from the roof where it is stored in a cistern for use in landscaping and toilet flushing. The center was designed with the employees in mind and all the office spaces enjoy natural daylight and low VOC finishes. Built from earth-toned precast concrete panels and corrugated steel and layered glazing, the center features a private courtyard next to the offices provides a quiet and protected space to rest and socialize. Sheehan Partners has designed and built another data center for Facebook in North Carolina, which is also expected to achieve LEED Gold status. The Prineville Data Center enjoys a high desert climate, meaning low humidity and temperatures that get pretty hot in the summer. At first, this wouldn't seem like a good place for a data center, but actually it is and Sheehan Partners capitalized on the climate in order to make the center more energy efficient. Data storage requires a lot of energy just to run the servers themselves, but the centers also have to work very hard to keep the equipment cool - hot computers don't run very well. The Prineville center relies on evaporative cooling - pulling in dry air, misting it with water and then as it evaporates the temperature lowers. In fact the system is so efficient, the center consumes almost zero energy to keep the servers cool. Facebook's Oregon center runs 38% more efficiently than other state-of-the-art data centers, yet it cost 24% less to construct. The EPA requires centers to run at power usage effectiveness ratio (PUE) of 1.5, but the Prineville center runs at 1.07, which is close to the ideal 1.0 where no energy is expended beyond what the computers use. Besides creating an super low energy cooling system, Sheehan Partners also worked hard ensure the center used as little energy as possible elsewhere. They topped the center with a photovoltaic system and harvest rainwater from the roof where it is stored in a cistern for use in landscaping and toilet flushing. The center was designed with the employees in mind and all the office spaces enjoy natural daylight and low VOC finishes. Built from earth-toned precast concrete panels and corrugated steel and layered glazing, the center also features a private courtyard next to the offices provides a quiet and protected space to rest and socialize. Sheehan Partners has designed and built another data center for Facebook in North Carolina, which is also expected to achieve LEED Gold status.